Leona May Baumgartner, 86, passed away on Monday, June 20, 2016, at Pleasant View Nursing Home, Monroe, Wisconsin. She was born on May 20, 1930, in Richfield Township, Adams County, Wisconsin, the daughter of Jay and Jessie (Gilden) Kitchen. Leona married Leon Baumgartner on Dec. 15, 1948, in Evansville, Wisconsin. He passed away on May 1, 2016. Leona was a homemaker and a former employee of Pleasant View Nursing Home. She was active in the Ladies Guild, 4-H, and her church as a Sunday school teacher and member of the church council. Leona and her husband Leon spent several winters in Bandera, Texas, where she was active in their retirement community. Leona also loved to read and write poetry. 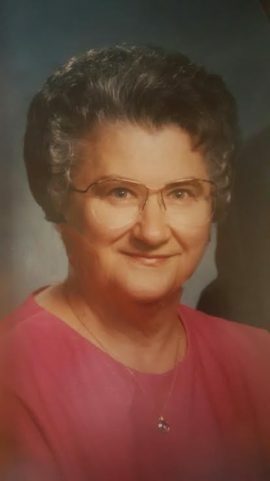 Leona is survived by her six children: Vicki Evenson, Vonda Fowler, Vanita (Richard) Baumgartner, Stacy (Dawn) Baumgartner, all of Brodhead, Scott (Gale) Baumgartner of Eddy, Texas, and Viane (Mike) Staniszewski of Ft. Myers, Florida; ten grandchildren and eight great-grandchildren; and two sisters-in-law: Norma Kitchen, of Rockford, Illinois and Edith Kitchen of Brodhead. Leona was preceded in death by her husband, Leon; her parents; two sisters and their spouses; six brothers and four of their spouses; and a grandson, Joshua Baumgartner. Funeral Services will be held at 3 p.m. tomorrow, Thursday, June 23 at the Congregational United Church of Christ in Brodhead, with Rev. David Frey officiating. Burial will be at Greenwood Cemetery in Brodhead. A visitation will be held from 1:30 p.m. until the time of services at the church. Thanks to the staff of Pleasant View Nursing Home in Monroe, where she spent the last two years, and to the Monroe Clinic Hospice for their help and support.